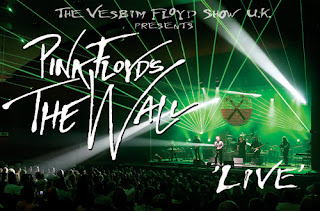 On Friday night we went to The Lowry to see Vesbim's Pink Floyd's The Wall. Mark is a big Pink Floyd fan so he was really looking forward to it and had been playing Pink Floyd all week in the hope that I would know some of the songs! 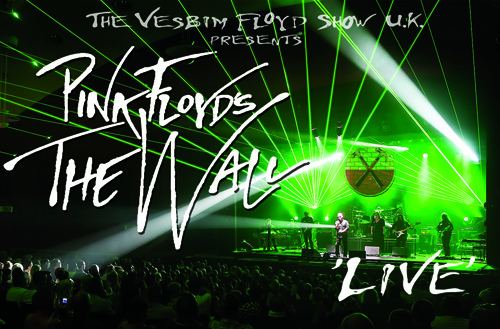 Vesbim Media have put together a 10 piece band of very talented musicians to bring Pink Floyd’s 1979 album “The Wall” back to the stage. The almost three hour show is split into two very separate parts, separated by the interval and the album is played without a break in the first half. Mark thought this worked very well as the album was written to be performed in its entirety. Three hours of Pink Floyd sounded a long time but considering I didn't recognise many of the tracks the show actually went remarkably fast The opening notes of the first song “In the Flesh?” had us both a little worried as the sound was quite distorted but that was soon sorted and as the band began to play with their instruments the sound quality improved. Essential to the Pink Floyd experience are the additional non-instrumental sounds - babies crying, aeroplanes, bombs, explosions etc. these were all present and worked very well to add to the performance. The show was performed in the 460 seat Quays theatre, which is a modern venue at Salford Quays with a more intimate feel than the larger Lyric theatre. Surprisingly the theatre wasn’t full, which led to a fairly flat atmosphere which was a real shame as any live performance is always enhanced when the audience gets behind the band. After the interval the band returned to the stage and began to play through a selection from Pink Floyd’s extensive back catalogue. Opening with audience favourite “Shine on you Crazy Diamond” and including most of the Dark Side of the Moon album the band really seemed to relax and began to enjoy themselves. After 50 more minutes of “Best of Floyd” the band closed the evening encouraging the audience to join in with “Wish You Were Here”. We were a little disappointed with the lighting of the show, the band’s website seems to promise lasers and impressive lighting effects but we didn't think the lights were anything special and if anything I found them too bright and had to look away when they flashed on. What did work well was the use of back projection throughout the night, making extensive use of Gerald Scarfe’s original animations from the accompanying movie. All of the band showed us that they were very skilled musicians, with vocalist Michael David Ronson really standing out for us. His delivery was excellent, very clear and his inflection was very close to the original. We did feel the band was lacking a powerful female vocalist especially noticeable to Mark on one of the tracks in the second half “Brain Damage”. It is difficult to pick out individuals but we really enjoyed the performances of Martin Byrne on bass and drummer Phil Westwood on the instrumental track “One of these Days” from the 1971 Meddle album. Whilst Mark is a huge fan of Pink Floyd, I’m much less familiar with their music and only knew a few of the tracks. This actually didn’t matter and I enjoyed seeing talented musicians performing a classic album. I’m sure I’ll be hearing much more Pink Floyd though as he has been playing his old albums since we got home! We were surprised that the band didn’t get more involved with the audience; no introductions, not even “Hello Salford”. I understand them wanting to launch straight into the album but thought perhaps at the start of the second half of the evening we would be introduced to the band members. Perhaps the audience would have got a little more involved if they had done? We really enjoyed our night out and would recommend any fan of Pink Floyd to go see them later in the year. We received free tickets for the show for the purpose of this review but all words and opinions are our own.